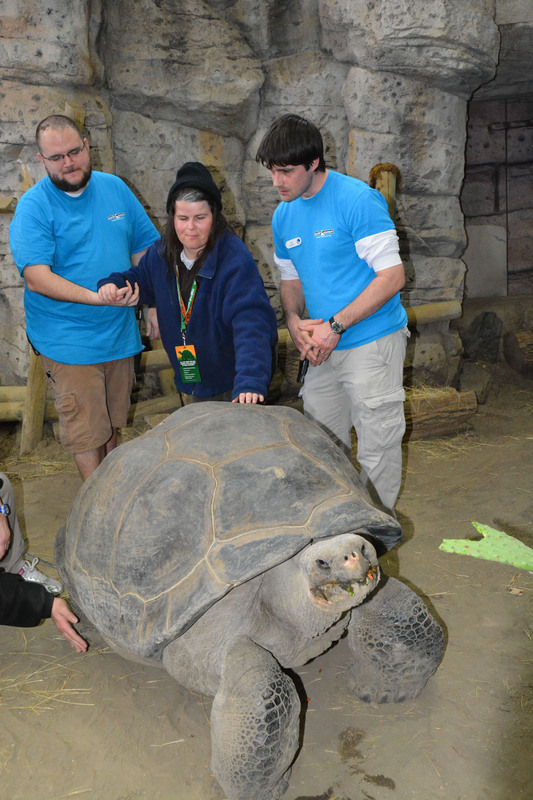 NEWPORT, Ky. – A longtime Newport Aquarium Annual Passholder was surprised Wednesday afternoon with an exclusive meet-and-greet with Bravo the Galapagos tortoise. Michelle Ridder, an Annual Passholder since 2009, arrived at Newport Aquarium around 2 p.m. Upon her arrival, aquarium staff informed Ridder, who has a physical condition that requires her to be wheelchair bound, that special arrangements were made for her to go behind the scenes of the Turtle Canyon exhibit to get up and close with Bravo, who at 650 pounds is the largest turtle in the Midwest. Michelle Ridder (center) touches Bravo the shell of Galapagos tortoise while Newport Aquarium exhibits staffers Kevin Sommerkamp (left) and Will Gosnell (right) assist. Visiting the aquarium 3-4 times per week on average throughout the years, Ridder earned the nickname “Penguin Michelle” for her frequency of backstage Penguin Encounter purchases. However, once Turtle Canyon opened in March 2014, Ridder developed a fondness for Bravo. The downtown Cincinnati resident missed the opportunity to purchase the Bravo VIP Experience, which was available for during the 2014 summer. When Newport Aquarium announced Turtle Canyon was closing March 1, Ridder made a priority to visit Bravo as possible. Aquarium staff took notice of her interest in the massive tortoise and decided to give her a once-in-a-lifetime experience to thank her for her dedication and loyalty to Newport Aquarium. Other guests can receive this exclusive encounter with Bravo through Newport Aquarium’s “I Heart Turtles Facebook Sweepstakes,” where one lucky guest and four of their friends will win an exclusive VIP Bravo Experience. The Facebook contest, which runs through Feb. 17, includes a prize package of five general admission tickets in addition to the private encounter with Bravo. For more information on Newport Aquarium, visit NewportAquarium.com or call toll free 800-406-FISH (3474). Newport Aquarium, voted the No. 1 aquarium in the country by USA Today’s 10Best.com in 2012, has showcased thousands of animals from around the world in a million gallons of water since 1999. Named a top U.S. aquarium by US City Traveler and Destinations Travel Magazine in 2014, and also by Travel Channel in 2013, Newport Aquarium is a Herschend Family Entertainment company and an accredited member of the Association of Zoos and Aquariums. Newport Aquarium is open to the public 365 days a year and is located across the Ohio River from downtown Cincinnati at Newport on the Levee. This entry was posted in Uncategorized and tagged Bravo, Galapagone, Galapagos tortoise, newport aquarium, penguins, VIP by NewportAquarium. Bookmark the permalink.